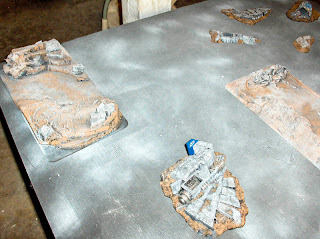 Here are some shots of my table for 40K, there are 3 different hills, two which provide good deployment cover or a ranged overview of the table, a center hill, and miscellaneous crater, and the crashed spaceship from the Battle of Macragge starter set. I am still working on the crashed ship and will eventually bring the color up to a battle scarred white (similar to the small piece in the bottom shot.) The tabletop itself can also use some work. I will probably glue down some fine sand in various spots and drybrush it brown to match the terrain. 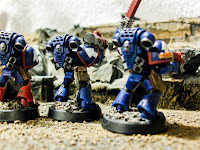 Regardless these are fine for playing the Macragge missions and I will continue to improve these during time I mentally need to work on something other than small figures. Current W.I.P- another tact squad, some elite units, and a Rhino APC. More soon.. Here are some pewter Reaper miniatures, I find painting the pewter minatures quite different than the plastic, but overall I think (hope) I can see my technique improving from these older pewter miniatures, to my current plastics. I have warhammer plastic fantasy miniatures waiting along with many other unpainted reaper figs, hoping for my 40K fetish to subside. 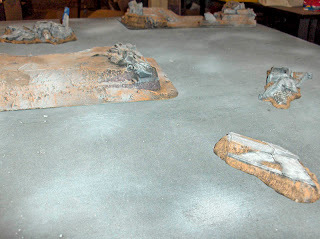 The crater was the first piece of terrain I made as well. 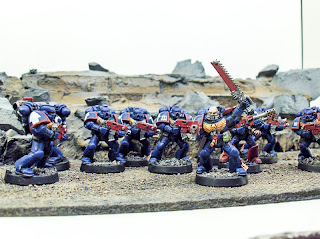 Here is the full tactical squad from the "Battle of Macragge " starter set. I built a quicky light box out of a cardboard box and some white posterboard. I need to work on the physical lighting but thanks to Photoshop and Lightroom it pretty much does the trick. I feel the overall quality of these guys is table top. no one unit particulary stands out and they have various blemishes given practicing various techniques along the way. 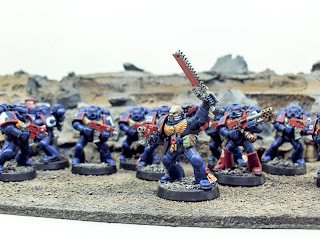 My 1000 point army contains 3 tactical squads, a fast attack group and a devastator heavy support squad with three APC's. I will continue to work on them as time permits. 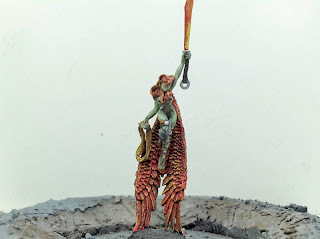 I also have about dozen Tyranids from the Macragge box and various terrain in the works,more soon. 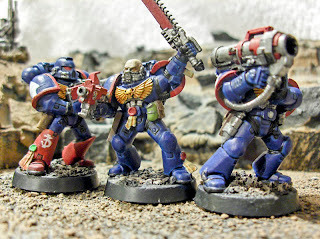 Above are the Sergeant, Flamer and Missile Launcher marines from the Warhammer 40k- "Battle for Macragge" starter set. 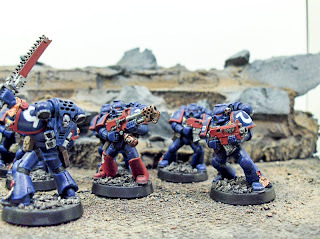 The units from the set are premolded making them cheaper, not as detailed and a bit trickier to paint than the standard models that you assemble. These guys are done to the point I am going to dullcote them, they wont win any awards, but they are surely table top quality for gaming. 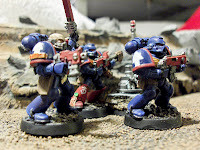 Note in the left photo my 1st attempt at blended highlighting on the armor edges, basically I used a thinned out lighter color made the lines, then came back with an even thinner mix of the original color and covered the highlighted line edge. This makes a smooth looking blended transition, I dont think it came out bad for my first real shot at. 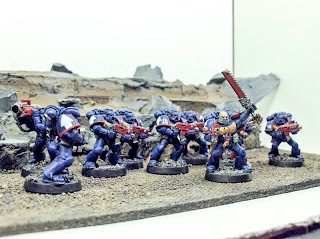 To the right you can see my homing becon and some hand painted tactical insignias. Working with the decals, despite reading several tutorials on it and buying some pricey decal solvent, turned out to be a nightmare. The number "3" on the flamethrower marine's leg is a decal despite using all the proper steps you can still see the decal edge. For me, free hand painting is the way to go. I spent about 4 hours practicing doing the Ultramarines symbol on a piece of wood. Once I got it down, the next problem was working on making them all the same size. Again I think they came out pretty decent a few look better than any of the test decals I tried. 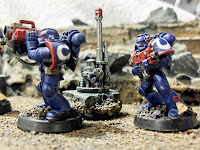 example the Missile Launcher Marine below is probably my best one, while on the Bolter Marine to the right you can see another one with a blemish I somehow didn't notice until this pic. I'll need to fix that, thanks to the pro's and con's of your digital camera's super macro function. 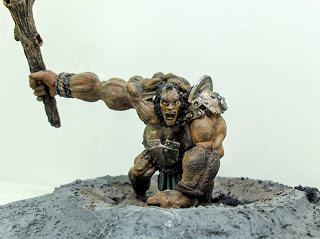 The background terrain is made from pink stuff foam and some broken clay tiles left over from remodeling my bathroom, Its primed with flat black krylon, then drybrushed with a reaper paint called "woodland brown', then I dust spray it with some auto motive gray Krylon. *Presto* quicky paint job equals dusty rocky alien planet. I have four nice pieces of terrain done. I will get around to detailing them some more eventually, but right now they are ready for play as is. 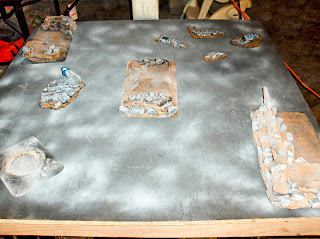 With all the terrain from the crashed spaceship in the Macragge set, I could set up a 6x4, or 8 x4 table easily. Next up- the rest of the Macragge tactical squad and my first Rhino armored personal carrier. 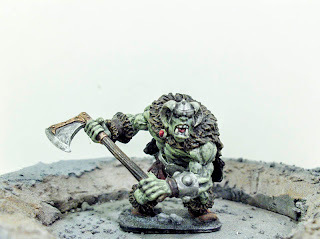 I will also try to post some of my reaper fantasy mini's as soon as I get some decent pics.